Trade Paperback Halloween-themed BIG MONSTER anthology. Featuring a mix of classic science fiction reprints and original stories all filled with: REALLY BIG MONSTERS! Includes legends such as Arthur C. Clark, H.P. 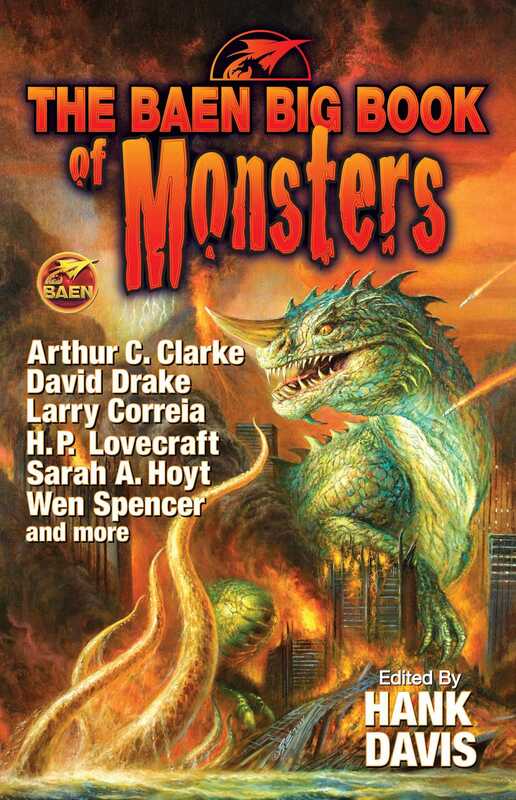 Lovecraft, Robert Bloch, David Drake and more, as well as Baen regulars New York Times best seller Larry Correia, Wen Spencer, Sarah A. Hoyt, and more. David Drake, best-selling author of the Hammer’s Slammers and RCN series, describes the far future plight of an unusual descendant of present-day humans, who’s being pursued by the descendants of another species, which are much larger than they were in our time. Robert Bloch, winner of the Hugo award and the lifetime achievement award of the World Fantasy Convention, and author of the classic horror novel Psycho, introduces an unusual orphan and aspiring thespian who was much more than he seemed and was destined to play the biggest role of anyone’s lifetime. Philip Wylie, co-author of the SF classic, When Worlds Collide and other imaginative works, tells of the arrival of a very, very tall giant on Earth and what happened next, in a sharp-edged satiric tale. Murray Leinster, known as the Dean of Science Fiction Writers, spins a yarn of a stranded starship whose crew must get replacement parts from an abandoned outpost in order to take off again—if they can reach the outpost through the swarming gigantic insect life of the planet. H.P. Lovecraft, renowned master of horror, is on board with a story of a star-spawned thing which was not only huge, but invisible as well. Plus all-new stories by New York Times best-selling author Larry Correia, and award-winning authors Sarah A. Hoyt and Wen Spencer. And much more.